For those who may mistake all LA contemporary dance as the same, I suggest you try out an NEDT performance! 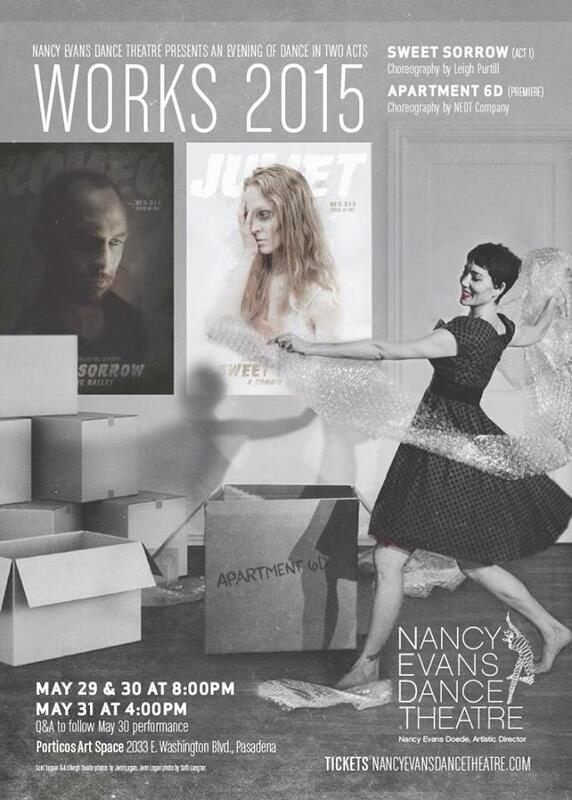 Nancy Evans Dance Theatre continues to pursue a unique blend of narrative based movement theater and modern dance aesthetics in a way that sets them apart from the rest. Last night’s performance at the Portico’s Arts Space in Pasadena included two works. The first half featured NEDT’s first ever guest choreographer, Leigh Purtill, who explores a world where ballet and zombies meet in Sweet Sorrow. The second half of the evening was a collaborative choreographic effort on behalf of the NEDT company members who created a charming piece about the life of an apartment aptly named Apartment 6D. I had seen an excerpt of Sweet Sorrow in its formative stages, and was a bit shocked when I was the only person who laughed out loud at this world of Romeo and Juliet turned zombie. Had I mistaken the choreographer’s intention? Was this a serious work? Seeing it now in a more completed state, I see that this work does intentionally border on absurd at times. I mean, repeatedly checking to see if someone is alive by lifting and dropping an arm is funny! However, the zombies were not the most surprising element of this piece, that award would have to go to the inclusion of pointe shoes. Gasp! NEDT is in my mind one of the few Classical Modern dance companies who really stick to their guns (aesthetically speaking) and here they were in pointe shoes! In fact, since the return of classically trained Ashleigh Doede to the company a few years ago, I had noticed a gradual shift toward a balletic aesthetic and tonight’s work solidified the balletic presence in the company. In addition to Doede and Amerine playing two corners of a love triangle in pointe shoes, the work featured a number of young ballerinas who performed as apprentices and guests of the company. However, any aesthetic territory gained by ballet vocabulary was balanced out by Jenn Logan’s outrageously committed performance as the Zombie Queen. Logan stayed rooted in her modern dance ways and gave the work a familiar solidity and intensity that I associate with NEDT. Overall, this piece included excellent make up for the zombies and some wonderful costumes by Jordan D. Waterman. Purtill’s choreography was most engaging during the classically balletic sections as they resonated most strongly with Prokofiev’s score. The zombie movement was less developed and played more to generic “zombie” actions like stiff walking, tilted heads and tensed arms and hands. While I am still wrapping my head around NEDT performing classical ballet, the joy of the work lies in the quirky concept that a zombie ballet could tell the lost story of Romeo and Juliet. Next season Purtill will continue to work with NEDT to develop the second act of the ballet and finish the story she has begun. Returning from intermission, Apartment 6D transported the audience from zombie land to the living room of an apartment, from the fantastical unreal to the wonderfully real. This work featured choreography by returning NEDT company members Katrine Amerine, Ashleigh Doede, Jen Hunter, Jenn Logan, and Scot Tupper as well as Artistic Director Nancy Evans Doede. The piece was charming, authentic, playful, emotional and whimsical as it related the history of this one apartment from the 1940’s through the present. While each piece had its charm, some of the most entertaining moments in the work were the theatrical skits of the “movers” who moved the tenants in and out between sections. These transitions were staged by Scot Tupper, who has a smart sense for character and comedy. Nancy Evans stole the show for me with her comic timing as the disgruntled mover. Another crowd pleaser was the duet choreographed by Katrina Amerine performed with fellow aerial artist Derek Meadows, The Leidenschafts (1999). This strength driven duet was by far the most physically demanding performance of the evening, with incredible partnering, risky dive rolls and impressive arms balances. However, what I appreciate most about the duet was that the jaw dropping elements were performed with a dance sensibility. The performers were invested emotionally and connected musically to the song by Julie Kent. This piece was not just acrobatics; it was nuanced in quality and narrative that earned it its place within a concert dance work. On a totally different note, Ashleigh Doede was cute as a button in Lucy (1959) in which she discovered the joys of bubble wrap! This piece by Jenn Logan was perfectly suited to her long line, her girly character and her spunky, playful side. My personal favorite, however, was another section choreographed by Logan entitled The Joneses (1966). This piece had the heart, choreographic design and nuanced character work that I associate with this group of performers. Logan was able to capture the essence of a dysfunctional family with swift head turns, sudden spins and elegant extensions in a way that perfectly balanced character development and choreographic design. The dancers seemed at home in this work and their ease in performance allowed them to shine at their best. The evening appropriately closed with Nancy Evans Doede’s delightful piece The Runaway set in present time. This piece was perhaps the one that transcended all time with it use of childlike wonder dashed with a bit of magic and a lot of whimsy. In this world, boxes and curtains came to life as a runaway girl looked for a safe place to sleep that night. The personification of the inanimate objects was fun and joyous and allowed the cast to end together on a high note of connection and joy. It was truly a very sweet ending that left the audience smiling as we headed home to our own living rooms. Additional Performers include: Natalie Kramer, Karina Jones, Elise Holmes, Anna Biosca, Abby Quinn and Grace Tiangco.